Since my awakening i had several encounters with angels, and energy beings. I never thought that i can peacefully go through such encounters without a bit of fear! Feeling happy, and at peace really took me by surprise because i always thought that it is scary to see something that is out of the physical world. In this post i am going to list some of the most profound encounters that i really enjoyed, i will also try to describe how it felt like, which is a very hard task because those feelings are hard to describe in physical terms. My First Encounter was shortly after my awakening, i was fully awake lying in bed and in the dark i saw an energy being hovering around the room, i was surprised to see this, and i kept staring for a long time to make sure that am no hallucinating! after a while i mentally asked this being to come closer, it felt peaceful, and i felt OK to do so. Then this being kept going through my body as if it was diving in the ocean, and i felt my whole body vibrating in a very peaceful sense as the this being dove in, it felt like i was receiving a wonderful cleansing, and this continued until i fell asleep. Till today this very same being visits my room from time to time, and it is always a blessing. What makes this experience special is that i never had to be in a trance state to encounter this being, i was able to see him while am fully awake, he has no shape, just energy moving around and it feels very beautiful. The Messengers Those are energy beings who come with valuable information, i encountered them twice in a trance state and it was a very profound experience. I cannot tell if they are angels, but they always came when i was about to make critical decisions. The first time i was visited by a messenger was two days after my out of body experience and when this being came it felt as if he is all over me, i was able to see him but it felt like i was inside of him, and i saw this stream of beautiful colors falling inside my crown chakra, and was unable to move, and the usual ringing noise was loud. At first i panicked, but in no time my peace was restored and i started enjoying the process not knowing what is happening at all!! After the experience i became fully awake and i had a strong knowing that this is my path! That i have to spread all the knowledge i receive. The second time was 4 months ago, and it was very similar to the first experience, except this time i saw my cats looking peacefully at this messenger, they even tried to follow him as he left. What is very unique about the messengers is that it is hard to understand the information that you receive during the process, but if you relax and allow this amazing transmission to complete you get out of the experience with a strong knowing of something you should do, a decision you should make, or new information that you couldn't have known on your own! Angels whisper! they offer profound guidance, they tell you what to do exactly when you need to do it, they tell you where your lost things are... They are so amazing! I never saw angels clearly, i usually see a spark of light that is very quick, a very sweet smell in the room, or a feeling of love or energetic hug that fills me with love! I cannot tell how many times i was protected, and guided by angels, but i always have nothing to say except Thank You! Thank You! Thank You! They whisper things like: Go this way, don't go this way, slow down accident ahead, stay home. And sometimes things like: We love you, you are loved, we are always with you, never worry. Angels offer healing too, their presence is so strong when am about to catch a disease, if my throat is starting to get sore, i feel them working on my throat and the next day i wake up just fine. 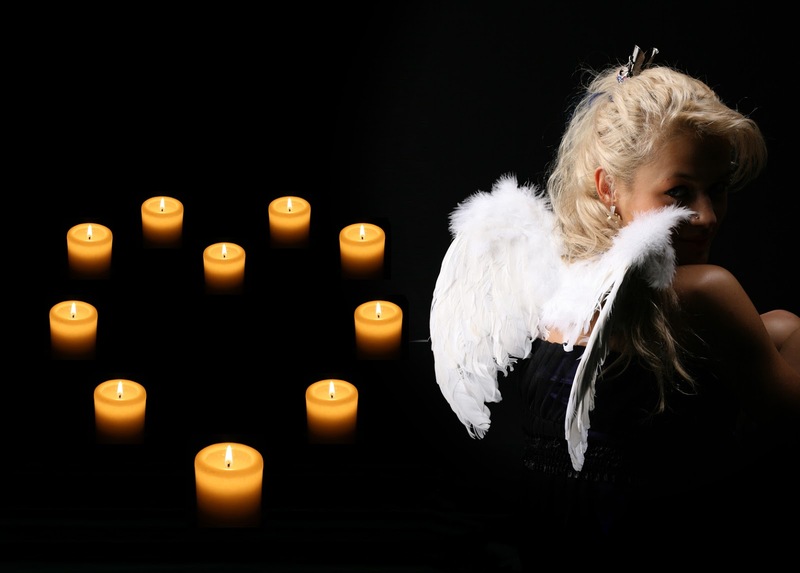 All angel's encounters are very special, and it is true that they are always around us wishing to help those who ask. Reiki Guides are very special too! Most Reiki masters encountered very giant guides, others speak of angels, and smaller kind of guides helping during a reiki healing session, however, my own personal experience with Reiki guides is different (so far), the ones i encountered are very small, and they come in large groups, they look like fairies, and they are amazing! Not only they push much energy through me; but also, they assist with the healing process, they group around chakras and fix what needs to be fixed. I will dedicate another post for my whole experience with Reiki as it is not the subject of this post. I will continue to write my update as i encounter new beings and spirit guides. Feel free to use the comment option if you have any question, or if you like to share your own personal encounters with angels, or other energy beings.